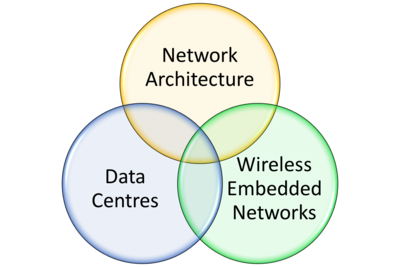 The overall architecture of both the Internet at large as well as specific network types like mobile backhaul networks or data centre networks is rapidly changing. A pivotal driver for this development has been the so-called softwarization of networks: Instead of conceiving of a network as a set of boxes and wires with essentially fixed functionality, a network is considered as a collection of general-purpose entities (with computing, storage, and communication capabilities) that are essentially freely programmable. Under this perspective, the control and provisioning of functionality becomes a new, challenging question for the design and operation of networks. Currently, these questions are investigated under different perspectives with distinct labels. Typically, the idea of software-defined networking (SDN) and network-function virtualization (NFV) stand out here. 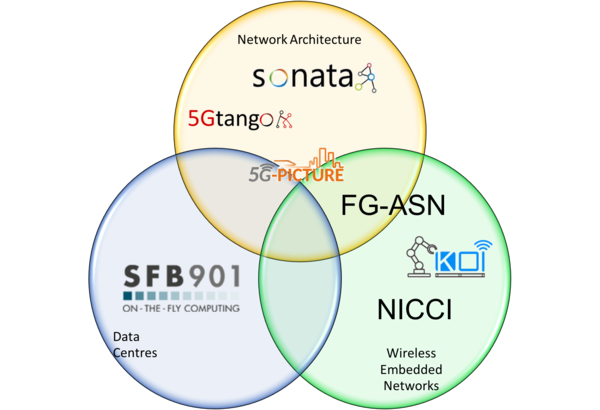 SDN usually refers to the notion of making network devices controllable from the outside via well-defined interfaces; NFV concentrates on the aspect of processing data flows inside a network device. We have worked and continue to work on these questions. Specifically, we are looking into the orchestration issue of such networks: where should which function be realized, how should this be triggered, reconfigured, controlled, interworked, implemented, tested, validated? This question of provisioning functionality also appears in another technical context: cloud computing, specifically, in distributed cloud computing (DCC). Here, the focus is conventionally on end-user oriented applications (like web servers, data bases, etc.). However, the fundamental orchestration questions in DCC are very similar to those in NFV. We are hence pursuing the convergence of these fields: deal with networking functionality and user functionality in a coordinated, consistent way, rather than trying to manage them separately. This creates a new perspective on what constitutes an application: network-support functionality (like firewalls, load balancers) is integrated with user-oriented functions (webserver, database, etc.) in an integrated whole. We build our solutions based on standard technology (e.g., cloud virtualization systems like Docker or Kubernetes) as well as on open-source systems, to which we actively contribute. For examples on research projects in this area, compare the Sonata, Tango, Picture or NetIDE projects. Our research group has, in the past, investigated wireless networking in many different scenarios (e.g., mobile ad hoc networks, mobile backhaul, densitfication of access networks). Currently, we look mostly into wireless networks that interact with a physical environment, e.g., in the context of a control application or custom-tailored for a particular application. In this context, we design custom communication protocols, leveraging or improving standard technologies, and integrating them with suitable network management ideas. We evaluate these ideas typically by simulation or by practical prototype. For examples on research projects in this area, compare the Acoustic Sensor Network project or NICCI. Data centres have become the invisible prerequisite for modern life: by far the largest share of everyday IT usage depends on a data somewhere – for messaging, social media, Web searches, etc. Their size and complexity has become awe-inspiring. In this context, we are particularly interested in how to improve operations and resource management (=network and computational resources) in data centres. This is challenging if there is little known about an application, but if there is some semantic understanding of the application, there is a good chance that operations can be improved. Such an understanding could, e.g., describe data communication patterns that appear in challenging big-data applications. For an example research project on this topic, see SFB 901. Depending on the concrete question, we bring different tools to bear. Often, algorithmic problems lend themselves to a formulation as an optimization problem. However, these problems are usually not optimally solvable in acceptable time; hence, we commonly look for heuristics or approximations to deal with practical problem sizes. The evaluation of such approaches can be done using simulation, emulation, or practical experiments. For all approaches, we have in the past developed tools that we have released as open-source contributions and will continue to do so in the future. In past research, we also looked at topics like wireless sensors networks in general, mobile ad hoc networks, information-centric networking, or cross-layer optimization of communication systems. In case you are interested in such areas, please do contact us; there might still be some opportunity to work on such topics.